The Big Game is almost here. Super Bowl LIII goes down on February 3rd, 2019 at Mercedes-Benz Stadium in Atlanta, Georgia. Football fans everywhere are getting excited for the game of the year (not to mention those of us who just watch for the commercials). We don’t know who’s playing yet, but the fans of the two teams who have the honor of playing this year will be lining up to witness the showdown — and the always memorable halftime show. If you’ve got plans to attend Super Bowl LIII, then you’ll want to make sure you know what to see, what to eat and where to stay before the first kickoff and after the final touchdown. 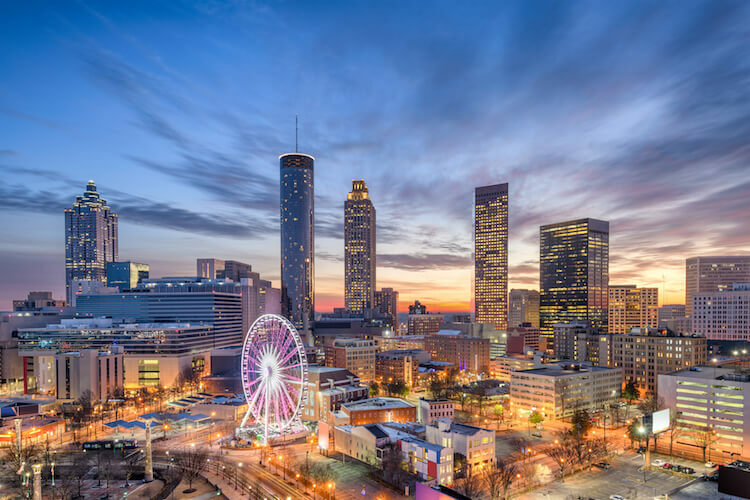 Read on to learn everything you need to know about Atlanta’s sightseeing, hotel, dining, and entertainment options, as well as the rundown on the game itself. Georgia has had its fair share of capital cities throughout its history. In fact, Atlanta is the state’s fifth capital. But there’s no doubt the state’s founders finally got it right with Atlanta. It survived being set on fire during the Civil War, and went on to become the birthplace of the Civil Rights Movement. The city has since become a very diverse metropolitan hub, noted for its international populous and mix of culture. It’s even host to the world’s largest Hindu temple! All that history and diversity has made for one of America’s most exciting cultural destinations and an obvious choice for this year’s Super Bowl. Get in some relaxation in the green space of Piedmont Park before heading to the neighboring Atlanta Botanical Garden for their current contemporary art exhibit Narcissus Garden. Gain perspective by learning about the important role the city has played in the fight for civil and human rights in America. Dive deep into the history of Atlanta at the sprawling Atlanta History Center, with exhibitions covering everything from BBQ and railroads to Coca-Cola and golf. Bringing the kids along? Zoo Atlanta and the Georgia Aquarium make for the perfect day for the whole family. Experience and support conservation in action at the zoo, then head under the sea at one of the world’s largest aquariums. Have time to catch more than the Super Bowl halftime show? Might as well do it at one of America’s most legendary theatres. Known for both its Moorish architecture and sold-out shows (the Broadway show Waitress will be starting its run at the Fox just two days after the Super Bowl), the Fox is a sure bet for entertainment in Atlanta. Any serious football fan with time to kill in downtown Atlanta will surely have this treasure on their itinerary. A visit to the Hall of Fame’s exhibits about the history of the game and its greatest players and coaches will you leave you with a newfound appreciation for college football, which is of course where all the players in this year’s Super Bowl got their start. The multi-purpose Mercedes-Benz Stadium is a cutting-edge innovation in arena architecture. The finishing touches were just put on this giant temple to the game (it seats 71,000 screaming fans) in 2018. The stadium is an architectural marvel that features a retractable roof (one of only five stadiums in America with such a feature). But this roof doesn’t just retract: eight triangular panels move in way that simulates a falcon’s wings expanding outward — an impressive sight and fitting nod to the home team’s namesake. Another incredible feature is the “halo board” video screen that loops in an oval shape around the entire stadium. This halo board is the world’s largest LED screen, and features stats, slow-motion replays and probably a few “kiss cam” shots for everyone to see. Maybe you’ll bring that special someone along with you to the game — after all, the Super Bowl is just a few days before Valentine’s Day. If you don’t already have your tickets to the game, then get ready for a bit of sticker shock — the NFL and Seatgeek have tickets starting around $3,400. Learn more about options for getting these lucrative tickets here. This Super Bowl is sure to be one you’ll never forget, and once the game starts you’ll probably want it to never end. Unfortunately, you will have to leave sometime, and you probably can’t sleep in the parking lot! So you’ll need to find a comfortable home base for your Super Bowl experience. The good news is that Atlanta has some seriously luxurious hotels to choose from. No matter where you are in the world, a Ritz-Carlton is synonymous with luxury and glamor. This location has a lobby bar with live music and an in-hotel coffee shop that add a touch of coziness, making the place feel like a home away from home. For a boutique experience in Atlanta’s business district, look no further than the Glenn. The hotel, housed in a historic 1923 piece of Modern Classic architecture, features rooms with original commissioned art and mouth-watering dishes at Glenn’s Kitchen. Head to the roof for a nightcap with a view at the hotel’s SkyLounge. Looking for luxury and a bit of escape from the Super Bowl crowds? You can get both while staying close to the action at the Four Seasons in Atlanta’s Midtown. The grandeur of the hotel’s marble staircase alone makes it worth it. You can also plan on sumptuous dining at in-house options Park 75 and Bar Margot. The amazing art on the walls is by local artists, which you can purchase and take home with you. By the time Valentine’s Day rolls around, you’ll probably be back home or on to your next adventure. But that doesn’t mean you can’t do a little homework to prepare for a romantic night out at one of Atlanta’s high-end eating establishments. The ever-changing tasting menu experience here is perfect for the foodie who doesn’t care what they eat, as long as it’s delectable. This restaurant satisfies more than your tastebuds — all after-tax profits benefit restaurant workers in need of emergency medical assistance, so you can rest assured you’re doing your part while partaking in an unforgettable meal. Bon Appétit called this intimate restaurant (only 14 tables) one of the country’s best in 2017, so visiting Spring is a no-brainer for foodies. The menu is always changing because it features local, ethical ingredients with a focus on sustainability and seasonality. A visit to Atlanta isn’t complete without some proper Southern comfort food, and Restaurant Eugene does just that — with a gourmet twist. Country ham and buttermilk hush puppies get the royal treatment from the restaurant’s James Beard award-winning chef. Now that you know everything you’re going to do in Atlanta while in town for the Super Bowl, the only thing left to figure out is how you’re going to get there. Why go through all the expense of a fancy hotel, upscale dinners, and pricey football tickets just to sit in a noisy, cramped airplane seat and deal with endless security lines there and back? The only travel option on the same level as the rest of your trip is a private charter jet, which will get you there faster and just as safely as a commercial airline. Plus, you’ll have plenty of room to stretch out while on board. And you can skip the security lines and even bring your pet! Oh, and baggage limits? Let’s just say there’s room for you to bring your giant foam finger on board, too.